Category Archives: St. Cuthbert’s Way. A WEE DONDER* a walk from the Southern Upland to the West Highland Way. I finished the Pennine Way at Kirk Yetholm 50 years ago and started the West Highland Way in Milngavie 15years later. So as part of my humble protracted Lands End – John o’Groats I could fill that gap. I’ve done K.Yetholm to Melrose on St. Cuthbert’s Way, and Melrose to Innerleithen on Southern Upland Way so I’m left with Innerleithen to Milngavie. Out with the maps and I realise by a combination of old railways and riverside paths I could have an easy week’s walking. I’ve called it the Lanarkshire Link. That highlighted a problem as rights of way are not shown on the OS maps of Scotland. There is no definitive map of rights of way as there is in England and Wales and no single place on the web where you can find out about them. Paths are marked with black dotted lines but that is no indication of whether they are passable. Finding out about footpaths through Scotways [Scottish Rights Of Way & Access Society] is cumbersome for a non local so we will just have to see how things work out on the ground. Interestingly ‘rights of way’ in Scotland can be lost if there is no evidence of their use over 20 years which seems heavily biased towards the landlords. I happened to mention my plans to JD, of Canary Island GR131 fame, who jumped at the chance of a bit of exercise and within hours he’d booked a train heading north. Cost less than £15 for Preston to Galashiels via Edinburgh. Finding accommodation in the various villages en-route wasn’t too big a problem although that will be more expensive. So we found ourselves on an afternoon bus from Galashiels asking for a ticket to Innerleithen, which we couldn’t pronounce. Even in the Borders the Scottish accent is going to be a problem. * Donder – To walk in a slow and carefree manner, not really concerned with how long it takes to arrive at one’s destination. Scottish slang. That is a good maxim to follow. This entry was posted in Long Distance Walks., Scotland., St. Cuthbert's Way., Walking. and tagged Kelvin Walkway, LEJOG, Long Distance Walks, Southern Scotland., The Clyde Walkway, Walking. on May 9, 2018 by bowlandclimber. ST. CUTHBERT’S WAY – THE END ALMOST. Yet another lift this morning – back to Detchant to rejoin the way. Sunny again. With views over the coast we walked along the ridge and then into the woods, lovely mixed woodland. This area seems to be popular as the tracks were very muddy, the worst on the trip. The pleasant rural scenery however made up for it . The village of Fenwick was passed without much fuss and then the busy A1 crossed back to quiet lanes. We started to meet several SCW walkers going E to W, they had crossed the causeway before the tide encroached. Crossing the main East Coast Railway line involved phoning the signalman to check no trains were coming – they approach at great speed. Our next hazard was a great big bull in a field, quickly passed! Safely at the coast there were reminders of our WW2 defences, concrete blocks to make landing difficult, fortunately never needed. The low lying seaward land was a sea of thrift. We knew the tides were against us today so a walk onto Lindisfarne awaits another time. [like the look of The Northumberland Coastal Path] All we had to do was dip our toes in the sea and phone a taxi to whisk us to Berwick, a quick lunchtime Chinese and the train home. Croft Cabs to the rescue. So another LDW completed. I would certainly recommend St. Cuthbert;s Way, easily accomplished with good paths through beautiful scenery. This entry was posted in Long Distance Walks., St. Cuthbert's Way., Walking. and tagged Long Distance Walks, Walking. on June 15, 2014 by bowlandclimber. ST. CUTHBERT’S WAY – CAUGHT IN THE RAIN. Approaching storm over the Cheviots. An early breakfast meant we got away in good time with a mixed forecast for the day. A long rising road took us out of Wooler and on to Weetwood Moor, a large open space above the town. Luckily the council team were out ahead of us strimming the weeds and bracken. Dropping down at the far end we had a good view of the 16th century elaborate Weetwood Bridge over the River Till which we crossed to follow lanes to the Horton Farms. Seen in the photo winding up the hill. This is a thriving agricultural area and the farmers were out cutting the grass, thus aggravating my hayfever. According to local legend the young St. Cuthbert tended sheep hereabouts. A fallow deer was spotted jumping through the grass. A drink/snack stop was taken on an old sandstone wall by old agricultural workers cottages. As soon as we left the heavy rain started with thunder in the air. Waterproofs on, we trudged along quiet lanes for about 3miles, there was very little shelter. Fortunately as we took to the fields again the rain stopped and as we approached the rocky escarpment ahead the sun reappeared. I’ve visited this area in the past climbing at Bowden and Kyloe, well known sandstone crags.Today we were looking for St. Cuthbert’s cave hidden in the woods. This is an overhanging sandstone cave where the monks fleeing from Lindisfarne perhaps rested with St. Cuthbert’s remains, AD875. It made a good rest stop for us looking out over the Cheviots. Climbing above it to a rocky tor gave even better views, now including the coast with Lindisfarne, The Farne Isles and Bamburgh Castle. And ‘they’ want to build a wind-farm here! I’m totally p….. o.. with our so called planning departments at the moment, it seems to be a free for all for the developers. 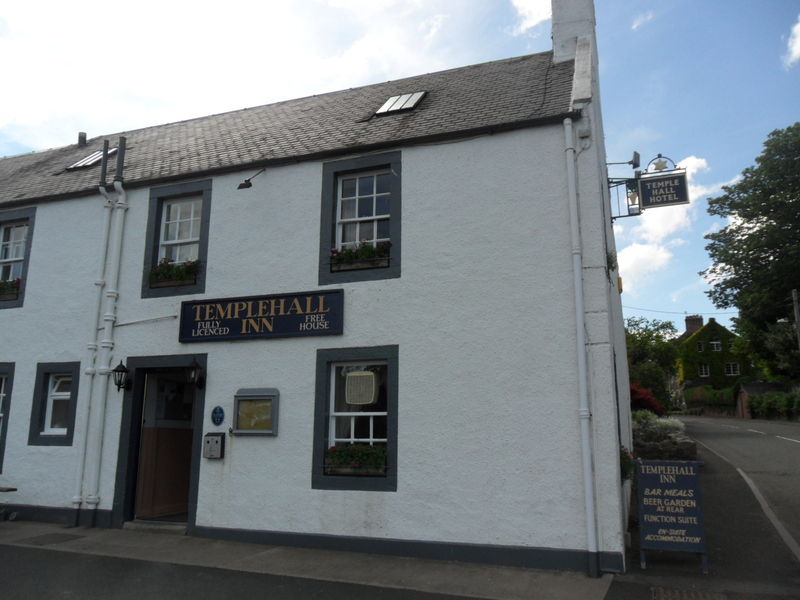 We left the way at Detchant to spend the night in Belford a pleasant market town on the old A1 road. ST. CUTHBERT’S WAY – THE CHEVIOTS Part 2. The return up the lane to rejoin our route seemed easy this morning – in our hostess’s car! She told us to look out for feral goats on the slopes of Yeavering Bell as we passed by, we saw none but there was a buzzard above and a kestrel hovering. The hilltop of Yeavering Bell, 361m, is encircled by a pre-historic stone wall clearly visible from a distance. The remains of many stone huts are to be found inside the hillfort. Shame we didn’t have the time or energy to visit. We reached the col between Yeavering Bell and Hare Law relatively easily and the visibility was good. At some point we must have entered The Northumberland National Park as new signs appeared depicting the elegant, and in these parts boisterous, Curlew. Open moorland walking was a delight today though at times boggy. We made the small diversion up to the trig point of Gains Law 319m for a snack stop and a chance to survey the Cheviots. The Cheviot summit at 815m seemed to overshadow everything else. Nearly every hill in the vicinity seemed to have a hillfort. Also In this area of moorland are some impressive examples of glacial meltwater channels. Soon the town of Wooler was spread out below us but it took some time to reach. We dropped into woodland and a country park on the edge of the town but then the way took us up in an arc into more forest before eventually following lanes to the main street of Wooler, a traditional market town. A welcome cafe on the corner of the High Street was our first point of call, The Terrace Cafe. Our B&B in the High Street was previously a bank with the manager’s living quarters above – lovely large rooms. A curry and some local beer were consumed. This entry was posted in Long Distance Walks., St. Cuthbert's Way., Walking. and tagged Long Distance Walks, Walking. on June 14, 2014 by bowlandclimber. 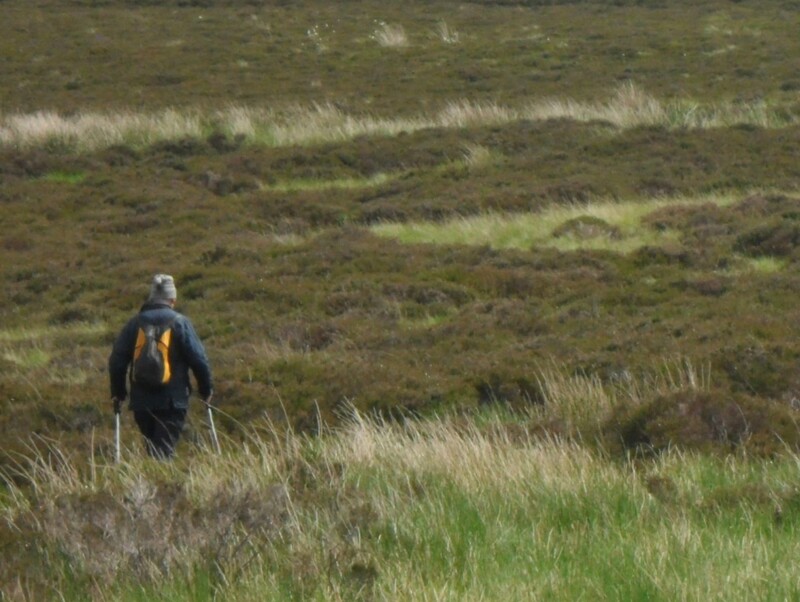 ST. CUTHBERT’S WAY – THE CHEVIOTS Part 1. This morning’s walk through Kirk Yetholm onto the Pennine Way was nostalgic as we had walked the PW together in 1965 but didn’t quite finish it, we cut off to Wooler to catch a bus. So today we were completing. The PW finishing in Kirk Yetholm must have helped this tiny hamlet’s economy, there are several B&Bs and The Border Hotel. We were too early to meet any Pennine Wayfarers on their last leg [or legs]. There was a collection of worn boots outside one house. You can just imagine their owners saying never again. St. Cuthbert’s Way leaves the PW after a mile or so and winds its way to cross the border into England high on the moors. The trail is well used but not badly eroded. Before long we were coming down into another valley. A dark pine plantation we walked through had a very spooky feeling to it – other walkers we met later had experienced the same. A remote farm was passed followed by a long walk down the Elsdon lane to Hethpool. This hamlet consists of a house, a farm and a row of associated cottages.These are executed in the Arts and Craft style and considered to be amongst the finest examples of such dwellings to be seen anywhere in Northumberland. A good spot for a lunch break in the sun. There were good views up the College Valley into the heart of the Cheviots. After crossing The College Burn we turned East on the slopes of Hare Law and gradually ascended to a remote shepherds cottage, Torleehouse. Ahead we could see a monument on Lanton Hill for Alexander Davison who was Chandler to Horatio Nelson at the Battle of Trafalgar, an unsung hero. Here we left the way for a stroll down the lane to our superb B&B at Old Yeavering cottage. ST. CUTHBERT’S WAY – THE HIGHEST POINT. We were heading into the Cheviots today. Chatting to a farmer, on the lane into the hills, he said he had over 1000 cattle in the fields, I cannot imagine how many sheep and lambs are at loose. Lapwings and cuckoos gave call and a buzzard quartered overhead. The way up was steep and direct but soon we were enjoying a snack, sheltered behind a wall from the wind, on the aptly named Wideopen Hill 368m. As well as being the highest point on St. Cuthberts Way it is also half way from Melrose to Lindisfarne. We were surrounded by hills, Horse riders made a dramatic appearance on the skyline. Morebattle was far below and the Yetholms visible ahead in the next valley. The forecast was for thunder storms in the afternoon so we didn’t hang around long. a good ridge walk eventually brought us down onto lanes leading into Town Yetholm. A few thatched cottages still exist here and the shop was luckily open when we arrived. Our pub for the night, The Plough, was on the village green. We were safely into our first pint when the storm started outside. ST. CUTHBERT’S WAY – THE SUN’S OUT. A very peaceful night in the cottage and breakfast without the dogs. We never seem to get away much before 9.30am but the day is not arduous and we have time to explore. The waymarking has been so good we have hardly had to consult map or guide. Amazing change in the weather after the rain of the last couple of days. Bright sunshine and warm from the start. Dispensed with the major uphill in the first mile or so climbing on Dere Street, Undulating sandstone ridges and valleys were then the nature of the day. This gave delightful countryside walking on a summer’s day. We met few people out and about, today a couple from the states walking SCW as part of their Scotland tour. We had our first clear views of The Cheviot Hills as we progressed towards the farming community of Cessford. In the past these farms must have employed a small army as each one has numerous workers’ cottages on site. Now vast fields of wheat and barley are harvested by monster machines. The next attraction was the ruin of the 15th century Cessford Castle on its fortified hill. The borders were a battle field for many years. The castle emitted solidarity and the beautiful red stone shone in the sunshine. Very impressive. Lane walking took us into Morebattle and our convivial pub for the night. This entry was posted in Long Distance Walks., St. Cuthbert's Way., Walking. and tagged Long Distance Walks, Walking. on June 13, 2014 by bowlandclimber.